Blend all ingredients except oats for about 10 seconds. Pour over oats and mix immediately until liquid is evenly distributed. Spread loosely onto 2 cookie sheets. Bake at 200 degrees (higher or lower depending on your oven) until crisp (approx. 6-9 hrs). Rotate every 3-4 hrs and mix at least once to decrease baking time. Once cooled, store in airtight container. Although it may be tempting to decrease the amount of oil, oil is what gives the granola a crispy texture (as opposed to hard like rocks - trust me, we tried!). Feel free to add nuts (slivered almonds, cashews, walnuts, etc), seeds (sesame seeds, sunflower seeds, flax, etc), shredded coconut, and dried fruit (add after baking if you want them to stay chewy - dried apples, raisins, diced dried apricots). You can also add almond or maple extract, a dash of cinnamon and nutmeg, or just about anything else you fancy. If you add other liquids (i.e. orange juice, coconut milk), adjust the amount of water so that your total amount of liquid stays about the same. If you like granola with clusters, let it bake for at least 5-6 hrs before mixing (allows the clusters to set). I line the cookie sheets with parchment paper so I can just lift and pour the finished granola into a container. Make sure to reuse the parchment paper! Can also be used as a fruit crisp topping, sprinkled on smoothies, or as a layer in parfaits. Pans of granola headed for the oven. Since this is supposed to be a crumb-saving recipe, the big question I know all of you are wondering is: “How much does this cost?” We’ve broken down the cost of the ingredients for one batch below based on the prices we pay at our local Aldi. Naturally your costs may vary depending on your cost of ingredients. *We have an electric oven and due to our solar panels, we pay nothing for the energy to bake this granola. If Al and I each ate granola every morning for breakfast, we would be spending approximately $9 for the whole month. Not too bad considering that store-bought granola usually costs about $3-4 per box which works out to be double the cost per serving or more (depending on how fancy of granola you choose). But if you want to really supersize your savings, eat your super easy, super cheap homemade granola with super easy, super cheap homemade rice milk. That’s a delicious Crumb Saver breakfast! So if you’re looking for a healthy way to save money on breakfast (and are getting tired of oatmeal every day), granola might be a good way for you to shave down your food budget without compromising health, taste, convenience, or time. Sounds appetizing to me! Hi guys, as usual great post, but I am not sure I agree with the ‘electricity is free to us, so we just ignore it in the cost calculation’. Even though it is ‘free’, you actually pay for it. In your case I would argue you pay the rate the energy company is giving you for the electricity your solar panels produce, since you consume this electricity rather than sell it to the utility company. I believe a typical oven consumes between 2 and 3 kW. So if you are baking a whole 9 hours, this is significant cost. If we assume 2 kW x 9 hours = 18 kWh = at least $2 depending on what is the cost of electricity where you live. This would increase your actual cost to at least $5 and possibly significantly more for many states. We don’t count the electricity for our oven because we’re only counting the actual dollars and cents that’s leaving our wallet. In our case, since we’re getting credits from the power company and our monthly solar power production exceeds our usage, we don’t actually “spend” anything. But you have a point that it still costs us in lost earnings, and certainly for others without solar panels they would need to pay for the energy. Electricity costs $.10/kWh for us, and if assuming 2 kW for baking at low heat for 9 hours (may be fewer hours), it’s up to an additional $1.80. Bringing the total for the batch to $4.79, or $.24 per serving. I bake mine at 225-250 degrees and it usually takes about 6-7 hrs. However, I have burned it on occasion, so with higher heat you need to make sure and check it more often and stir more frequently. Not having as many large clusters will also speed the bake time. Every oven is a bit different, but I don’t think I would go much higher than 250 degrees as granola needs the slow bake to keep the crunch without getting too brown. Hope it turns out well for you! Let us know if you discover a way to cut the time! This is basically the recipe we use! We got it from my husband’s grandma who calls it Crunchy Breakfast. Since I know you guys care about every penny, we usually make this with white sugar rather than brown. This comes out cheaper, esp since we buy white sugar by the 25lb sack. We don’t use that much, it just doesn’t go bad. So we only need to buy it every few years. Good point! That would definitely cut the cost. I think we could probably cut out the vanilla too as I’m not sure how much difference it actually makes. Have you tried this in a crockpot? No, but that sounds intriguing. Would definitely keep the house cooler during the summer. I’d be interested to hear if you ever try it and how it works out for you! What is the shelf life of the granola? 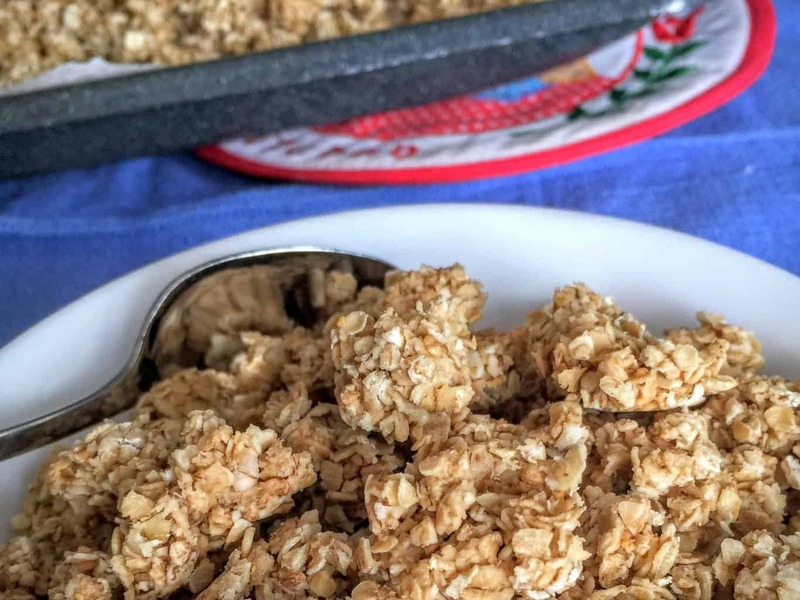 Have you looked into using whole oats? They’re better for you. We can buy in 20 lb. bags from Amish/Mennonite bulk stores for negligible. I think I remember you live in midwest. You’re bound to have one near or maybe like in our case near a friend that we see fairly often. I have looked for a chunky, economical granola recipe for awhile now and had been having no luck. We’ve made your recipe three times now and it fits the bill. It is great tasting, easy to fiddle with, and it turns out great chunks. Thanks for a great recipe! I hope you are are both doing well! And I am also hoping that you both write more posts eventually! Thank you for this blog. It has been inspiring to me! We are finally debt free and saving to pay cash for a car and home! Yhis granola recipe is excellent to feed our family of 6 cheap!